How We Roll, Sept. 12ish: I’m using my smartypants phone to call a cheap taxi! Things to listen to whilst transiting 1: A new podcast by Metro and The Glue called Off Peak. The introductory episode: “True Tales from Metro Bus Operators.” To put it another way, some pretty good stories from the cockpits of Metro buses. Things to listen to whilst transiting 2: Joe Lemon and I are not paid to be NFL experts. We are paid to promote transit and other transportationy things. The point of our 10-minute podcast (scroll down a bit) last week was to show we could predict the Super Bowl opponents as good as any so-called expert, schmexpert. And, after one week of play, my picks (Bengals and Vikings) are a combined 2-0 and Joe’s are 1-1 — and only because his picks, the Pats and Cards, played one another. Go Metro the Rams home opener: More info here on getting to the Coliseum to the see the Rams play the Seahawks this coming Sunday. The Rams open with the Santa Clara 49ers tonight. The Source likes Los Angeles, 17-13, because the ‘Niners are one of the Source’s quartet of most despised NFL teams, joining the Steelers, Browns and Cowboys. TUESDAY UPDATE: My forecast was a little inaccurate, the 49ers defensive backfield had a little too much fun and the Rams have a few areas where they might want to improve before playing the Seahawks and Russell Wilson’s gimpy ankle on Sunday. No one asked the Source, but taking Rich Hill out of the game was probably smart given the Dodgers still must get past (pick two) the Giants, Mets, Nationals, Cardinals and/or Cubs in the NL playoffs next month. As for the LAT story, it occurs to me that I’ve never had a Presidente beer and certainly haven’t seen any gracing the shelves of my local Vons or Gas-N-Sip. Peter King concurs over at MMQB that pulling Hill was a shame but a necessity. As buses begin to operate autonomously, it will allow them to navigate city streets more efficiently, making those connections even more seamless and serving neighborhoods more reliably. Eventually, on-demand “micro transit”—small, smart buses that can change their routes on the fly—will fill in the gaps for people who aren’t well served by fixed routes, meaning Angelenos won’t need their own cars, especially for short trips. I think that if I was a bus operator, I’d probably be picking up paper/pen/carrier pigeon/laptop to say something about this. Unless I missed it, I don’t think anyone has definitively proven that a bus driven by a robot is any more efficient than one driven by a human being. Don’t get me wrong. It’s fun to think about the future! And it’s smart. I often think about the day I’ll be answering to the apes and what I might say to keep me knee-deep in bananas and outside-the-cage privileges. But I suppose there’s two approaches to this: pre-suppose exactly what the future may look like or let it happen a bit more organically. Speaking of self-driving things…. Steelers fans and future self-driving car test subjects. Sometimes there is justice in life. Photo by Jen Robinson, via Flickr creative commons. It’s hardly news that Uber and other firms are using Pittsburgh as a testing ground for autonomous cars. The city and Carnegie Mellon University have been smart about providing resources. 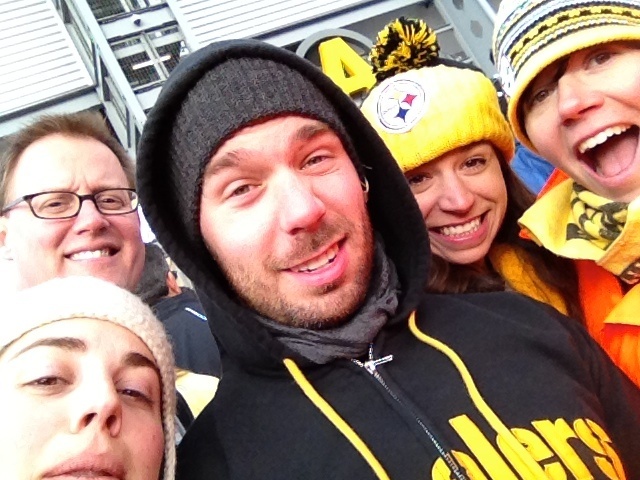 Attentive readers know that I’m 110 percent for using Steelers fans as guinea pigs. Mr. Peduto said Uber did not have too much power in Pittsburgh and said the city would be safe because there would be a human monitor in the Uber test cars. The mayor also has his eye on a bigger safety goal. “There is no technology that is fail-proof and there is no tech that can guarantee there won’t be accidents, but right now there are 3,287 people who die in automobile-related accidents around the world each day, and there has to be a better way,” he said. Above, we see the city of L.A. & Curbed saying self-driving buses will be smarter. Now we have the mayor of Pittsburgh saying self-driving Ubers will be safer. I was mildly surprised the NYT didn’t point out that self-driving Ubers have the potential to eliminate the pesky cost of human labor. Nor did they question how fast/slow self-driving Ubers would be compared to the human ones. Nor did the NYT show me any stats about the safety of taxis/ride-hailing versus the safety of all vehicles. It seems to me that many people are taking it as an article of faith that self-driving this-or-that is always better than human-driven this-or-that. True, humans have often proven to be lousy at driving — far too many of us manage to wrap our vehicles around trees, etc., each year. But it would be great if the self-driving-this-or-that proponents could state clearly exactly why we’re doing this and maybe provide some stats. I’ll tell you a story. Back in days of yore (the early 1990s), I moved to Gotham for a job. I smartly sold my Geo Storm before going. And when I got to Gotham, I discovered this wonderful way of getting around besides the ever-present subway. You could step out to the curb, raise your arm into the air and a car — usually painted yellow — would magically appear and take you anywhere you want. It was pricier than the subway but at certain times of the day/night, it was a really easy way to get around, especially when one might be too tipsy to deal with the subway stairs. You didn’t even need to pay $100 a month for a smartphone to hail a cab. In fact, the technology was so popular that you could find it in pretty much any city in the U.S. In some places, you could even summon a taxi with a telephone, albeit the kind that you plugged into a wall. The big difference between the taxis and the new ride-hailing? The new form of ride hailing made it cheaper and made it easy with the smartphone. Ride hailing cars don’t have to troll for customers, as taxis often did. I suppose the non-trolling part is a step forward. The cheaper part is nice for consumers because we all know that cheaper is always better, right? Feel free to comment or email me if my thinking on this is all screwed up and I need to be re-educated or re-propogandized. Quasi-related thought 1: I don’t think all the self-driving ride hailing in the world will eliminate the need for trains and buses that can carry a boatload of people to a variety of destinations. Quasi-related thought 2: I’m mulling banning the term “ride-hailing” in this space in favor of “cheap taxis.” I’m a bit more of a Grumpy Bear than usual for a Monday morning, so I’ll think upon it later when I’m a little less clear headed. Someone please do the math on how far you could travel in three minutes both vertically and horizontally. If the numbers are favorable, I’m taking this to the innovation people. A former colleague — okay, well actually an LATer I never knew — moves to L.A. from Palo Alto and is mildly surprised at the rising cost of rents and homes and the ongoing mansionization of her L.A. neighborhood. Until the next crash — which is probably a ‘when’ not ‘if’ thing — crushingly expensive housing sure seems like it will be the new normal in our region. Remember in the above item when I talked about moving to New York? I was shocked by the housing prices and sold my car in order to afford it. It will be interesting to see how many people in L.A> save money for housing by ditching a car in favor of transit, walking, biking, Zipcars and cheap phone-oriented taxis. The N Judah light rail line is notoriously crowded in San Francisco. So the Muni is doing something about it by adding a couple of trains during the morning peak that will only run a portion of the line where passengers often had a difficult time getting seats or even finding space on trains. Clever. UPDATE: I’m surprised none of our regular commenters wrote “Metro should do this after the Crenshaw/LAX Line opens.” Once that project opens, Crenshaw trains will terminate at Crenshaw/Expo Station and, presumably, a lot of passengers will come up to street level to catch the Expo Line in both directions. At that time, Expo trains will be running more frequently and with all three-car trains, but I’m sure as we get closer there will be questions about capacity, etc. The advantage of self driving is mostly in cost savings. There are other advantages, such as not needing drivers to show in person so no late buses due to lack of drivers and no tired drivers on late night routes. There would also be faster turn around since you wouldn’t need to stop to provide breaks for human drivers. However, the main reason it’s being pushed is for cost savings. That’s right! If the cost of a bus operator is actually that much more than developing, buying and maintaining the technology involved in a self-driving bus. And if — big if — the self driving bus is actually better than a human-driven one. I think the point of all the Uber, micro-transit, ride-hailing talk isn’t necessaily the amount of people moved per vehicle as important a distinction as that may be but rather the “on-demand” aspect. Metro and it’s counterparts in other cities truly have to come around to cracking that nut or the private industry will have their lunch one day soon. Fixed routes and waitng for the next over-crowded ride are all well and good for now but consumers won’t wait around forever. Seems to me that one way for fixed-route buses to deal with on-demand is to simply offer more frequent service. As for on-demand, having a bus travel to your front door (for pickup and dropoff) sounds great. As long as there are a ton of buses to hit all those destinations. Or you sit and wait. And what happens if all those on-demand buses create and get stuck in traffic. Sure, it’s better than everyone having their own car (it reduces need for ton of parking) but still sounds like a recipe for a lot of traffic and transit that’s not as fast as the futurist crowd would have you believe. Is it a ton of buses though? Or a bunch of mini buses? Or a service yet imagined? More frequent buses on fixed routes are certainly easily imagined but it seems the public’s appetite for bus service as it’s commonly understood is growing less and less with each passing year. It could be going the way of the dodo. Besides, most transit agenices can’t begin to afford more frequent bus service at all hours. Or even Metro’s light rail service for that matter. What I’m suggesting may not amount to the traffic recipe you’re anticipating. More on-demand ride services would conceiveably amount to less car ownership per capita which would begin to limit the overall amount of cars on the road relative to the population in transit. If subscription services offered rates based on the potential passengers per vehicle –a ride on a mini bus would cost considerably less than single occupancy vehicle– one would still have door to door service in a promised time frame while maintaining a lighter vehicle “footprint”. I’m reminded of that meme that transit cheerleaders like to roll out during conversations like this. Picture number one shows a street full of cars and the capiton reads 50 people taking 50 cars. There’s a second picture of an otherwise empty street except for the bus which of course carries 50 people. There’s at least a third way here: an otherwise empty street except for 4 mini buses and two cars. Those 50 people got where they needed to get too and they didn’t get clogged streets either. Headline on the Judah train should use the word ‘train’ and not ‘tree’. Anyone ever get “shuttle rage” after taking a shuttle home from the airport and waiting forever while it drove all over the place to drop off nine other people? In effron’s world you will get it daily. No you wouldn’t. On demand services that track vehicle pick-up and give time of arrival drop-offs prior to pickup would ensure no such thing. Any service provider tied to a subscription base with ambitions for renewals would see to it. Unless of course you cheaped out, paid for “just get me there, I don’t care when” service, sure, but that would be of your own perverse, rage seeking volition. To each their own. Self driving buses will still be slow in Los Angeles if LADOT continues rejecting bus lanes and transit priority.